A digital books initiative from Atyaasaa provides a platform for speedy reading on topics related to management, human behaviours, organizational development and may more. This digital books contains all the knowledge amassed since the inception of Atyaasaa which will help the readers to get insights on a plethora of topics. 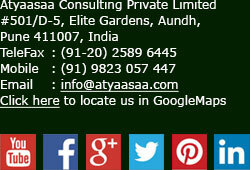 Feel free to visit for constant updates and enriching your knowledge regularly.